Demonstrate your mental prowess with Sudoku, the addictive puzzle game. To play Sudoku, fill in the partial grid of numbers, ensuring that every row, column and 3x3 box contains the digits 1 through 9; if filled in correctly, there would be no repeats. To solve a Sudoku puzzle, use logic and process of elimination to rule out the digits that don't belong, until what you have left is the correct answer for each cell. Every Sudoku puzzle will have a unique (one and only one) solution. Sudoku was popularized in Japan in the 1980s and 1990s and has since become a worldwide phenomenon, appearing in almost every newspaper in the English-speaking world. Sudoku transcends language barriers in that it uses numbers, and yet it doesn't require math skill, but Sudoku does require process of elimination and deductive reasoning. Sudoku has quickly become one of the most popular puzzle games in the world, and is now enjoyed online. Many puzzle fans also enjoy other online games, which can be played for fun or for real money. Casino/gambling games like these offer an easy way to have fun online without taxing the brain! Did you know there are some kinds of sudoku that can be used in online casinos? On a website like onlinecasinosrealmoney.co.nz you will find plenty of options to play the games you like for free or, if you feel like it, for a real money gamble! On the road? At the beach? In a boring staff meeting? Stay up-to-date with the daily Sudoku puzzles by playing the mobile version on your phone! 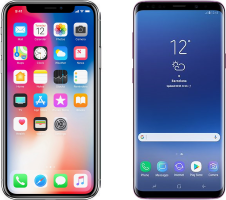 Just navigate to this website in your phone's browser, and you will automatically be redirected to the mobile version. Or type m.sudokupuzzler.com directly into your mobile browser. Enjoy! According to quantitative tests, Sudoku Puzzler has a wider difficulty range than most nationally syndicated Sudoku puzzles. In other words, the other guys' Hard puzzles are about equivalent to their Medium puzzles. I know, right? For more information please see the Sudoku Syndication page. In addition to Sudoku for print publications, Sudoku Puzzler offers a free, interactive Sudoku web feature, with the daily newspaper's Sudoku puzzle and searchable Sudoku archive. Feel free to download Sudoku Puzzler's samples in PDF. Ready for a bigger challenge? 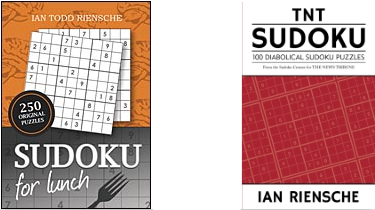 Try Sudoku for Lunch published by Tate Publishing, or TNT Sudoku published by Amazon CreateSpace. Sudoku for Lunch contains 200 original 9x9 Sudoku puzzles of varying difficulty levels, and 50 original 6x6 Sudoku puzzles. 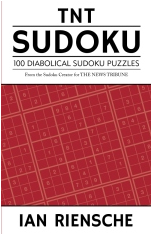 TNT Sudoku contains 100 of Ian's Diabolical Sudoku puzzles as printed in The News Tribune of Tacoma. Click here for more information!